World Horse Welfare will be playing host to a demonstration by champion equestrian sportswoman Lucinda Fredericks. The lecture demo evening will be held at Hall Farm Rescue and Rehoming Centre, Snetterton, on Saturday 23rd February. Lucinda, a star of the equestrian world, will be delighting the audience with a display of the talent which has enabled her to reach the highest echelons of three-day eventing. The demo is being held at 6.30pm on Saturday 23rd February, with doors open from 6pm. Tickets are £20 for adults or £12 for children aged 14 years and under. For more information and to book your tickets contact Maxine Langley on 01953 499100/07801 880201. One of the country’s fastest growing equestrian sports is gaining in popularity in Cambridge. Vaulting – gymnastics on horseback – has already prompted two well-attended training courses at the College of West Anglia’s Milton campus. A dozen people, some as young as 9-years-old, have completed each of the six-week courses. And they have been able to use Herbie, an experienced vaulting horse, who has been loaned to the campus by Julie Newell, a British team coach. The newly-named Cambridge Campus Vaulters holds sessions on a Monday evening from 6 to 7.30pm at a cost of £12 for each session during the six-week programme. For further details, contact Jade Rouchy on 01223 860701. ‘Cover Star’ winner Debbie Weymouth recently received her free canvas from Eastern Light Photography after winning the Absolute Horse competition for a shoot with Nigel Baker. Debbie’s moving story of dramatic weight loss in order for her to ride again won us all over and she was truly an inspirational person to meet. 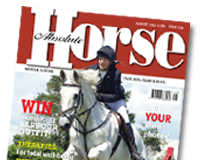 Debbie and her stunning horse Victor made perfect front cover models for the November issue of Absolute Horse magazine. Applications are open for talented young riders across South England to apply for funding for 2013 from the GLL Sport Foundation (GSF) – an independent athlete support scheme set up to support the next generation of emerging talent. A Norwich woman was recently sentenced to a ten-year ban from keeping horses after the charity World Horse Welfare found an Arab mare and Thoroughbred gelding belonging to her in very poor condition. Mrs Sally Rix of Furze Lane, Felthorpe, Norwich, pleaded guilty to five charges under the Animal Welfare Act of causing unnecessary suffering to Henry, the 5-year-old bay Thoroughbred gelding, and the 25-year-old grey Arab mare called Angel, earlier this year. Alltech recently launched their new Equine Heroes campaign. Lincolnshire-based rider Bert Sheffield, has been selected onto the Lincolnshire Elite Athlete Programme (LEAP) for 2013 which provides funding for equipment and training. The scheme is designed to co-ordinate support for talented sports people from Lincolnshire and provide a legacy supporting athletes for potential selection for future Games. The current UK sports system provides funding for top-end elite performers through Lottery funding, but the tier below that has what could be best described as ‘patchwork’ support. LEAP offers a better, more consistent level of support to that level of performer in Lincolnshire. Bert, who is sponsored by HorseHage will also be making her debut on her younger horse, Double Agent, in British Dressage and Para-Dressage competitions next year. There are still places left for the very popular conference, scheduled for 23rd and 24th February at the Ramada Hotel and Arena UK Grantham.